Below is a listing of pre-designed Minister and Priest Stoles with prices. Unless otherwise stated, these stoles do not have any image on the back of the neck. If you would like something a little different to the items listed, please get in touch and I will be happy to work with you on your new design. Put your tape measure at the centre back of your neck, then bring it over to your front and down to the length you require. Most stoles look best if they’re about calf length. The design for this stole features the footprints of different peoples walking together in community and celebration. This stole has a Cross Patee on the back of the neck. This stole has a narrow panel down the centre back. This panel may be plain or embroidered. The price quoted here is for the un-embroidered back panel. This wildflower design also looks great on a green background. Forest at moonrise. A richly embroidered image of the the life journey. Rocks and shadows lie along the path, dimly illumined by the moon. The southern cross stars hover above the trees.A combination of fabric painting and free machine embroidery has been used to create this image. The fountain is an ancient, but still relevant symbol of cleansing and renewal; giving life and abundance to all.I've used metallic threads, satin fabrics, free machine embroidery and applique to create this image. Hand painted image of the sun rising over water. The red and green Kangaroo Paw here is the Western Australian floral emblem. The stars are appliquéd in shiny silver or gold, or even shiny green in this case! This stole features the fallen, burnt follicles of the Banksia spinulosa, which have released their seed, and then regenerated to produce flowers of beauty and abundance, with an Easter Sunburst. A striking Easter sunrise in stained glass appliqué. This stole features the fallen, burnt follicles of the Banksia serrata (Old Man Banksia), which have released their seed, and then regenerated to produce flowers of beauty and abundance. A bold image of promise and celebration. The gift of life moves out in all directions, breaking down all barriers. Gold and orange iridescent and satin fabrics appliquéd on a red background. A bold flame design for Pentecost, embroidered in stained glass appliqué. Rays of light radiate in all directions from the Christ and Advent candles, offering healing and support. In this version a crown of thorns surrounds the candles, and the 5 stars of the southern cross hover above. Here a combination of fabric paint, appliqué and free machine embroidery has been used to create a stunning image for life. A Lenten stole reflecting the spiritual journey - embroidered on a purple background fabric. I've used a combination of fabric paint, appliqué and free machine embroidery for this image. The stole pictured has a rounded back. It can be made with either a rounded or pointed back. The three dancing figures are supported by the 'hand' of God, and are celebrating freedom and life. Geese care for each other on their long migratory flights, so the Australian Magpie Goose is a symbol of community and trust. A new Australian design for Advent - an image of flowing water with the stars of the Southern Cross. A new design ! This one on an Advent stole, but the design could be used for other church seasons! A stunning design in Stained Glass applique. Great for any celebration. 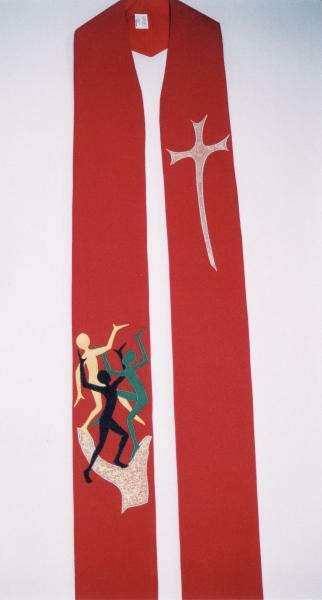 This is the standard preaching scarf of the Uniting Church of Australia. It can be made to your required length. This scarf was designed & made for Frontier Services, a service of the Uniting Church of Australia which works with people- families & communities - in remote locations. This stole is mainly designed for weddings but could also be used for Baptism. It features Water flowing from a shell, plus the Dove of peace carrying 2 rings. This stole also features a small Celtic Cross (Ref. 339) at the back of the neck. The Passion Cross with Crown of Thorns is on both panels of the stole, and the Greek cross (Ref. 334) is on the back at the neck.